In Abuja became the second country to announce plans to take a country pavilion at the Intra-African Trade Fair (IATF) being organised by the African Export-Import Bank (Afreximbank) in Cairo from 11 to 17 December. Prof. Yemi Osinbajo, Vice President of Nigeria, who made the announcement during an engagement session on the IATF co-organised by Afreximbank and the Nigerian Export Promotion Council (NEPC), said that Nigeria would participate effectively in the Trade Fair and would use it as an opportunity to showcase its trade and investment opportunities. In June, South Africa announced that it would take a country pavilion. … said Prof. Osinbajo, who was represented by Rahman Adeola Ipaye, Deputy Chief of Staff in the Nigerian Presidency. He urged Nigerian companies and states to book space at the trade fair in order to showcase their unique goods and services, asking them to spread word about the trade fair to their networks so as to ensure that Nigeria was properly represented. Also speaking, Mohammed Badaru Abubakar, Governor of Jigawa State of Nigeria, said that there was need to reinforce the collective belief that African economic liberation could only be realized by and within the African continent. Represented by Ibrahim Hassan, Deputy Governor of the state, Alhaji Abubakar, who is also Chairman National Committee on Export Promotion of the National Economic Council, said that Nigeria was committed to leveraging on the opportunities to be created by the trade fair to expand its continental trade. 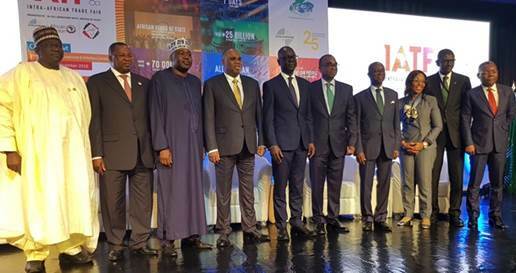 Earlier, Kanayo Awani, Managing Director of the Intra-African Trade Initiative at Afreximbank, said that the aim of the IATF was to close the gap on access to trade and market information in Africa, adding that the trade fair would create a sustainable platform for connecting buyers and sellers across Africa. Also speaking, Olusegun Awolowo, Executive Director of NEPC, said that the IATF would enable Nigeria to tap its export potential with the rest of Africa. He put Nigeria’s export potential with West Africa at $200 million, out of which $102.1 remained untapped, while for North Africa, it was $31 million, with $16.1 untapped. The engagement session also featured a panel discussion by Afreximbank President Dr. Benedict Oramah; Albert Muchanga, Commissioner for Trade and Industry of the African Union; Abba Bello, Managing Director, Nigerian Export-Import Bank; Iyalode Alaba Lawson, President, Nigerian Association of Chambers of Commerce, Industry, Mines and Agriculture; and Victor Osadolor, Deputy Managing Director, UBA. Hosted by Egypt, through the Export Development Authority, and organised in collaboration with the African Union and several other partners, the IATF is aimed at deepening trade ties among African countries and at supporting the implementation of the African Continental Free Trade Area (AfCFTA) Agreement. The Abuja session is the third in a promotional programme for IATF2018 and follows similar sessions in Cairo and Johannesburg. Sessions are also planned for Nairobi and Abidjan. Features of IATF2018 include a trade services portal, country pavilions, and a virtual trade fair component that will serve as an ongoing electronic exhibition which will outlast the physical fair.